We are delighted to announce our upcoming Conversation with our Dean, Professor Marianne Lewis and Susan Kilsby. Susan Kilsby is a renowned leader across business, finance and Mergers and Acquisitions. 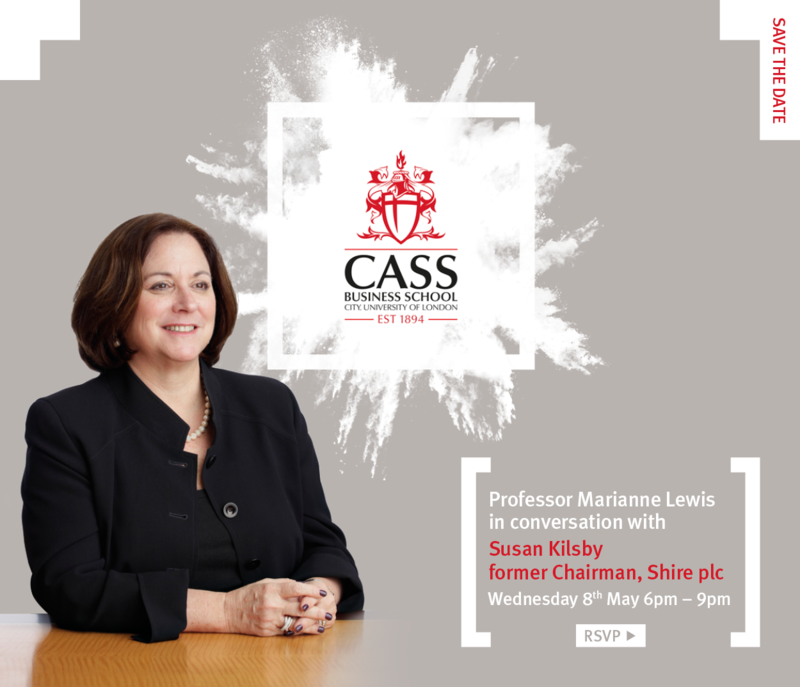 She will discuss leadership, governance, and her career to date in an exclusive fireside chat with Professor Marianne Lewis, Dean of Cass Business School. Susan retired in January as Chairman of Shire plc, a top 20 FTSE100 business that focuses on developing and delivering innovative therapies for people with rare diseases and highly specialised conditions. She currently serves on the Boards of Diageo, BHP, BBA Aviation and Fortune Brands Home and Security. Her prior experience includes serving Credit Suisse as Chairman, EMEA Mergers and Acquisitions. At Cass, Susan is Chair of the Mergers & Acquisitions Research Centre, a Senior Visiting Fellow, and in 2016 received an honorary doctorate in recognition of her outstanding business leadership and contribution to higher education. Event timings 6:00pm - 9:00pm. The Cass M&A Research Centre (MARC), founded in 2008, is the only such research centre at any major business school focused on both the research and practice of M&A. With its proximity to the City of London, Cass is perfectly placed to maintain close contacts with M&A bankers, lawyers, consultants, accountants, journalists and other key players.The result has been and is new, cutting-edge insights into the entire M&A field, from deal origination to completion, from financing to integration, from emerging markets to the boardrooms of the world's largest companies. We're looking forward to welcoming you to the event.